When Disney wiped the Star Wars canon clean, they meant it, and since then old characters, ideas, and settings have been introduced only slowly. But a couple of tweets from yesterday suggest that the newest addition is, well, not one anybody suspected. 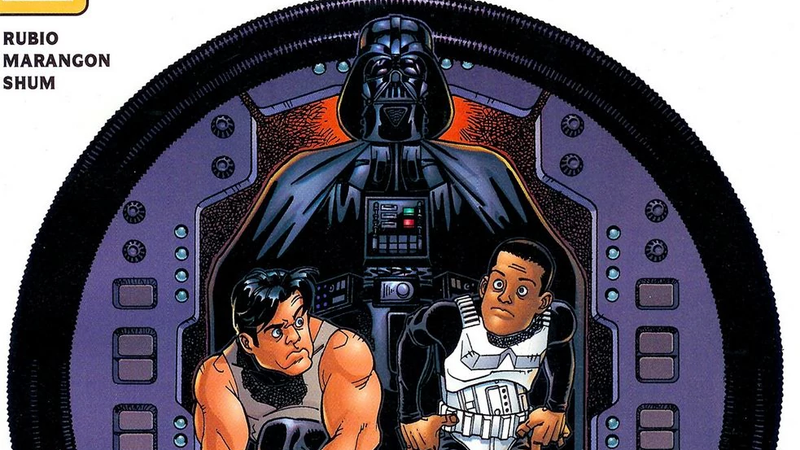 For those of us who weren’t reading the Star Wars Tales comics in the early 2000s, Tag and Bink are comedic characters created by writer Kevin Rubio. The two bumbling protagonists are rebels whose stories slide in and out of the major events of the universe in unlikely, silly ways. Think Rosencrantz and Guildenstern Are Dead, but for Star Wars. Even at the time, these stories were non-canon, taking place in the “Infinities” continuity with other alternate universe stories. What at first glance struck me as likely an in-joke was later seemingly confirmed by screenwriter Jon Kasdan (son of Lawrence), who worked with his dad to write the screenplay of the film. Talking with Kevin Rubio himself, Kasdan confirmed that those two characters were Tag and Bink, and that Kasdan himself is one of the men in the shot (the other being assistant director Toby Hefferman). To be realistic, this will probably stick to fun cameo territory—maybe a pair of background characters getting up to hijinks, if even that. But it’s a welcome indication that the creators at Lucasfilm are digging pretty deep for ideas. Maybe we can get a movie about that one Infinities story where Vader survived the events of Return of the Jedi and painted his armor white.